Pickled shrimp have long been a favorite dish for alfresco occasions and lend a little touch of refinement to even the most modest events. Strictly speaking, the shrimp aren’t pickled, they’re simply marinated in a tangy solution of vinegar with lemon juice, herbs and spices for such a time that they’re infused with a tart, pungent flavor that works very well on a warm afternoon or evening. Use shrimp of almost any size for this dish, but I’d recommend a larger count, nothing smaller than a 26/30, though a 21/25 is ideal. Boil the shrimp in the usual manner, taking care not to overcook them, peel and for this recipe devein. Now, use socks of herbs and spices along with the pungent Cajun seasonings you might like; there ain’t nothin’ sissy about my shrimp salad. 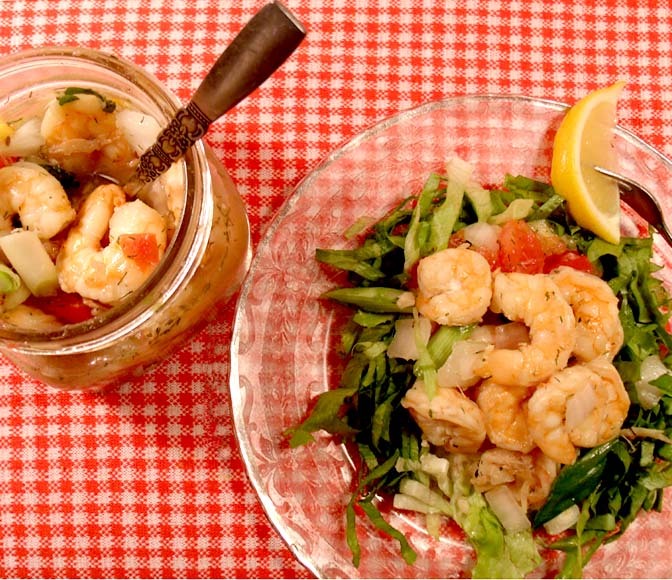 For each pound of cooked shrimp, add half a cup of diced white onion, seeded ripe tomato and peeled cucumber along with a few green onions cut on the bias and at least one (two is better) cloves of crushed, finely-minced garlic. Toss with a cup of white vinegar, two tablespoons sugar, the juice of half a lemon, and season with salt, black pepper, thyme, basil and dill. (Do NOT add oil to this marinade; instead, serve with a good olive oil on the table. Add water to cover if needed and refrigerate overnight. It helps to stir the mixture at least once, and once again later is better. Serve over salad greens with crusty bread.